Xyloband contains led and radio frequency receivers. The wristbands light can be controlled by a software program, which send signal to wristband, instructing it to light up or blink. Xylobands are first used on Coldplay’s 2012 Mylo Xyloto tour. At the time of concert, xyloband was given to each member of the audience. The Flashing of wristband was transpired to the music. LED bracelets are offered in 2 distinct formats. Standard Style Glow & Flash LED wristbands – This can be used in 4 modes. Each mode is activated by pushing the button on the top of the case. The LED wristband includes multi-color changes and 7 case colors including transparent, which allows the LED Glow to illuminate the case. These xylobands will flash to the beat of songs or the vibration of speakers. They can even perform quit well as a motion activated flash if there is enough movement/vibration to trigger the sensor. The LED sensor is turned on with a simple on/off switch located on the side of the case. 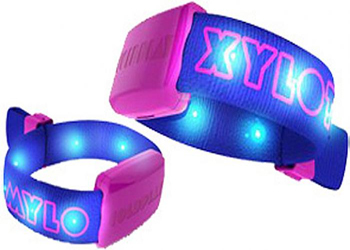 Xylobands are constructed out of thick fabric with LEDs inside the fabric. A radio receiver is located within a plastic case on the band, and it receives wireless signals from a controller. These signals are sent either by a remote controller or laptop controller linked to a radio transmitter. The operator of the controller or laptop software may program all wristbands or only those of certain colors to flash on and off at specific intervals and specific moments. 1.Xylobands can have customer suggested logo or brand image onto the wristband strap as well as the battery casing. 11.The wristbands are not affected by smoke machines, adverse weather conditions because of radio frequency. 2. It can shift color due to age and temperature. 3. Contrast ratios not consistent.